Galeria Plaza Reforma is a luxurious 4-star hotel which is set in a prime location in Zona Rosa, Mexico. Renowned as Mexico's leading hotel, it serves as a perfect base for exploring the surrounding areas. Breakfast and dinner are included in the pilgrim package at Galeria Plaza. OLEO Cancun Playa is an exclusive 4.5 Star All-Inclusive Boutique Resort, designed to offer an experience steeped in minimalist luxury. Its cozy areas, blessed with an avant-garde design, surround its guests in an artistic, contemporary and sensorial environment. Facilities include 4 restaurants, 2 bars, tennis court, state of the art gym, spa, beachfront, and for disabled guests elevators and ramps. Arrival at the airport. Meet your local guide at the International arrival hall at the airport. Transfer to your hotel. Dinner and overnight stay. This morning after breakfast you will visit the most important religious site of Latin America: the Sanctuary of the Virgin of Guadalupe, to celebrate Holy Mass. After Holy Mass enjoy a guided tour of the various points of interest; visiting the Old and New Basilica, the Tepeyac Hill, the Chapels of the Indians and of the Well, the gardens, as well as the original piece of cloth on which the Virgin’s image appeared to the young shepherd boy, Juan Diego. After a full day, you will return to your hotel for dinner. This morning you will depart early to Square of the Three Cultures and the Church of St. James, where there will be Holy Mass. Continue to Tulpetlac at the Parish of San Bernardino, place of the 6th apparition of Our Lady of Guadalupe, before continuing to Teotihuacan, about 60km northeast of the capital. Here you will visit the most impressive archaeological site of the central highlands: Teotihuacán (UNESCO World Cultural Heritage), the Citadel, the Quetzalcoatl Temple, the Road of the Dead, Pyramids of the Sun and the Moon, as well as the Palace of Quetzalpapalotl and the Jaguar Temple. Do not miss the inspiring pre-hispanic paintings hidden in some of the less visited parts of the site. This evening you will return to Mexico city to your hotel for dinner and overnight stay. The day begins with a journey to Mexico City towards Cuernavaca the city of Eternal Spring, where you will visit the Cathedral and the Museum and continue through the Southern Sierra Madre and the Valley of Morelos. Hidden away we find the city of Taxco “ the Silver city”, famous for the production of silver. You will see ateliers with the famous Silver jewellery, before visiting the Church of Santa Prisca to celebrate Mass. Return to Mexico City to your hotel for overnight stay and dinner. This morning make the short journey along the Paseo de la Reforma Avenue to the Chapultepec Park where you will reach the Museum of Anthropology, for a visit of a few of the most important exhibit halls. From here you will visit the Zocalo for a visit to the Metropolitan Cathedral, the National Palace, the Palace of the Archbishop Juan de Zumarraga, to the Santo Domingo Church and the Shrine of Our Lady of the Rosary and of Our Lady of Covadonga. After lunch this afternoon, return to the Shrine of Our Lady of Guadalupe for a thanksgiving Mass, rosary and procession. This evening return to the hotel for dinner. This morning you will be transferred to the airport in order to board your flight to Cancún. At Cancún airport you will have a meet and greet from a local guide and transfer to your all inclusive hotel. Enjoy the afternoon at leisure in resort. 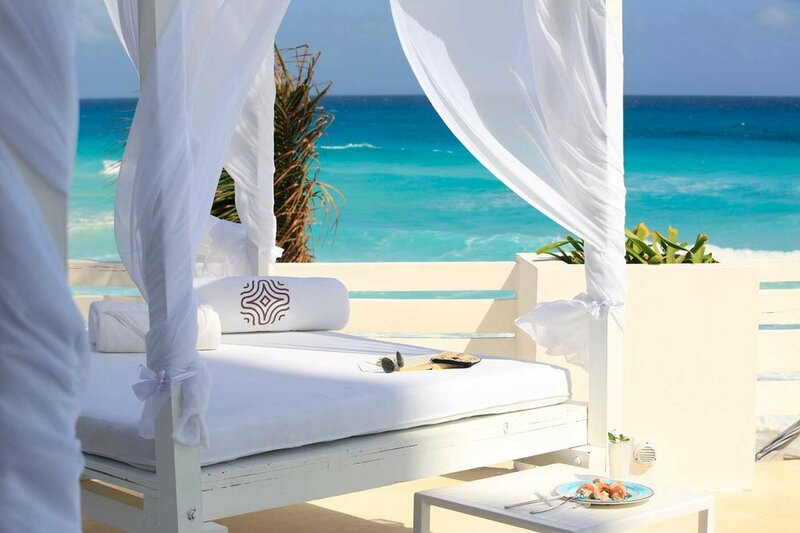 Relax and enjoy this 4-night 5* all-inclusive break on the beach of Cancún. This relaxing end to the pilgrimage will be accompanied by an optional spiritual programme of daily prayer and Holy Mass. Cancún is located in Quintana Roo, where there are Mayan culture shines on every corner. Surrounded by the breathtaking Caribbean Sea, soft coral sands, and the striking shade of blue that emerges from its crystal-clear waters, a visit to Cancún will make you marvel at the beauty of God's creation. After breakfast this morning you will check out of your hotel and transfer to the airport of Cancún for your direct flight back home.